The Round Table knights were noble men who led King Arthur's kingdom to victory, and now they will lead you to amazing prizes on this entertaining slots game. 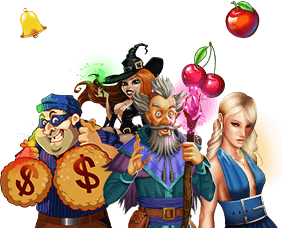 Enjoy the sweet taste of victory when winning at this great 25-line Medieval-themed slots game. The White Knight and the Black Knight will help you in your quest for treasure and the beautiful graphic interface will whisk you away to the land of castles and dragons. Conquer rival kingdoms' treasures with the help of courageous knight here! To get started, choose the number of lines you'd like to play with (1-25) and the bet amount per line you'd like to wager with (from $0.05 to $50.00). To set the reels in motion, click "Spin". Use the up and down arrows to set the amount you'd like to bet on per line. You can set the bet amount from just 5 cents to $50 per line. Use the up and down arrows that surround the line display to choose how many lines you want to play per spin. After selecting these, just hit Spin to start the reels in motion. Use the Autoplay function to set a certain number of preset bets to run automatically. If you are not sure about how the Autoplay function works, feel free to visit our Instant Play section, where you can play free slots without restrictions. The White Knight is the scatter symbol in Coat of Arms and when two or more of these symbols appear scattered across the wheel, the Re-Spin Feature will be triggered automatically. All scatter wins are multiplied by the triggering bet and all prizes are awarded automatically. In Coat of Arms, the Black Knight symbol is the Wild Symbol and it doubles all prizes when it appears in any winning combination. Triggering the Re-Spin feature is quite simple; all you need is at least two scattered White Knight symbols. The remaining reels spin up to 10 times to award heaps of free prizes. When a bonus Golden Shield appears on reels 1, 2 and 3, prizes are multiplied up to 4 times and 15 free games will be awarded to you. Be on the lookout for bonus crowns, as 5 or more crowns gotten throughout the bonus round will award you with more free games. Scatter Symbol: This symbol helps to boost your bankroll wherever they land on the reels. Two or more of these symbols will also trigger the bonus round. Bonus Feature: The bonus feature is triggered automatically when 2 or more scatter symbols appear on the reels, this feature award you with free spins and extra cash prizes. Random Progressive Jackpot: In this game, the jackpot is triggered randomly, which means that it can be won at any point during the game. Autoplay: The Autoplay function lets you preset a certain number of spins to play automatically, allowing you to win without having to lift a finger.